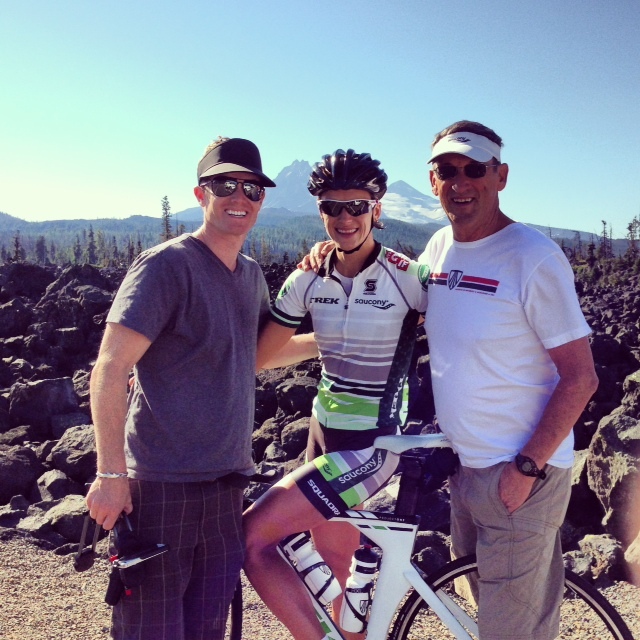 We are about 3 weeks out from the Ironman World Championships and I am topping off on my preparations here in Bend. I came to Bend last year for a good month and really enjoyed it - Bend has wonderful cycling, great training partners, awesome Fall weather, Chris reports in that the Steelhead run on the Deschutes has been a memorable one and lastly, we also get the big benefit of support from my parents - who spoil us rotten with good eats, family time, lending a hand with my training needs, and they are pretty darn fun to hang out with, too! I have been meaning to update for a while and have had a few ideas of what to write about - but today on a run I thought I would write about the beauty of the challenge and how it can relate to most of us training and preparing for Ironman Hawaii. First a bit of a backstory, which could be long, but I will make it as brief as possible. Since March I have been having constant pain in my lower tibia. Dr. John Ball in Phoenix was a great help in guiding me through the pain and helping me get in very minimal running which also resulted in minimal racing. I had a few great performances (the win at Mt Tremblant 70.3 in June would have to be the highlight) and I also have had a few races where I significantly performed below my liking but on par with my setback (ahem, Vineman). After Vineman I pulled the plug on all running. I was cracked - both mentally, and now physically. I spent a good junk of July in a walking boot. Feeling sorry for myself. August I pulled up the patience pants and still wasn’t running, but maintaining a newfound likeness to 5k swims and lots of riding miles. My guns & buns program was progressing nicely at the gym - I still haven’t given up hope on my Kona dream. I started back up running again and the pain returned. Ugh. Really?! I reached some pretty low spots this summer - wondering if this would ever end, why does my body hate me so much, how come things aren’t going according to plan, what do you mean I am not in control of my own body & it’s healing process, what if I can’t race Ironman Hawaii, what if, what if, what if? Time seemed to keep ticking away on the calendar of one week without running, then another week and with each week my frustrations seemed to deepen. This kind of lit a fire under my belly. A light switch flipped. All the sudden I looked at my set-back as an exciting challenge rather than the world’s largest pity party. Insert the great crew at Rebound in Bend. Jay Dicharry took me under his wing (thanks for the top-notch recommendation: Matt Lieto). Rebound welcomed me in as part of the family. Jay has been a wealth of knowledge and enthusiasm working diligently with me 4-5 times a week on everything including strength, balance, getting my big toe to march up and down - hello, new party trick! - to improving my running form. In the past few weeks I have quit focusing on outcome driven goals (Ironman Hawaii - mainly) and my focus has now been on daily tasks, such as toe marching. My progression has come quickly and I have been logging some running and it’s been going surprisingly well. This means, I now have less than a month to panic train! My thoughts during my run today & the whole reason I wanted to share this via my webpage is this - we are all faced with our own personal challenge. If I was healthy and running in July & August, I would be challenged with difficult run workouts. Many of us conquer challenges each day, and don’t even realize it. Perhaps your personal challenge is managing your kids, family & work? Maybe your challenge is a physical ailment like mine? Or perhaps you’re at home in bed with the flu? A broken bike? Nasty co-worker? Sibling rivalry? Lost your favorite bike socks? Bad break-up? Some people are feeling challenged by the physical elements that Hawaii will present - heat, wind & humidity? Maybe you are feeling financially challenged? All of these situations present a type of adversity and how you face it determines if you will conquer your challenge or let it conquer you. Regrettably, I have had days where I let the challenge of an injury win. I also have had many days where that’s not the case. The reason I signed up for Ironman in the first place was I was looking for a good challenge. While feeling deep down in the dumps all it took was that light switch - rather than waste my time and energy feeling ungrateful for what I wasn’t able to do and how my run training has been limited and not ideal - I made the executive decision that it’s time to take the bull by the horns and embrace a good challenge! If you see me during the marathon in Kona, just remember - I love a good challenge. Best of luck in your preparations & I hope everyone is looking forward to sharing in the Aloha spirit. Not long now!